This BBC One/AMC six-episode adaptation of John le Carré ‘s 1983 spy-thriller The Little Drummer Girl opens with a bang as a suitcase bomb destroys a building in Cologne, Germany killing its occupant, the Israeli attaché. Martin Kurtz (Michael Shannon), an Israeli spymaster quickly assembles his investigative team at Mossad headquarters: Miss Bach (Clare Holman), Schwilli (Gennady Fleischer), Litvak (Michael Moshonov), Rachel (Simona Brown), and Oded (Roee Adar). They soon discover that infamous Palestinian terrorist Khalil’s little brother Salim (Amil Khoury) had his paramour Anna Witgen (Iben Akerlie) plant the explosives in the attaché’s home. Charmian “Charlie” Ross (Florence Pugh) is a baby-faced English stage actress who spouts expletives and liberal-leaning slogans. During a performance of St. Joan, she gets the attention of Israeli intelligence officer Gadi Becker (Alexander Skarsgård) who surreptitiously invites her, her boyfriend Al (Max Irons), and the rest of her theatrical troupe to the Greek island of Naxos. After Becker wows Charlie with a private late-night tour of some ancient ruins, he takes her to a Mossad safe house where she will prepare for her role as the “little drummer girl” and infiltrate Khalil’s organization. Becker has Charlie handwrite “love letters” supposedly addressed to Salim, fleshing out the new identity she will assume to convince Khalil about her close relationship with his brother. The Israeli agents apprehend Salim and Anna in Munich and after the pair are interrogated, they are drugged and incinerated in a car rigged with explosives. When Charlie finds out about these murders, she threatens to bail on the mission but Becker successfully seduces her and she proceeds with her training. Arriving in Lebanon, Charlie gets driven to Khalil’s PLO training camp where she learns how to use deadly weapons and barely avoids being killed during the camp’s intense bombing. Now in London, Kurtz’s team photographs encrypted postcards that are briefly intercepted before being mailed to Khalil’s operatives. The postcards’ deciphered clues indicate that the next bombing will occur during a speech by a famed Israeli academic, Professor Minkel (Ricki Hayut) at the London Polytechnic Institute. Kurtz reports his findings to antisemitic British Intelligence director Picton (Charles Dance) who reluctantly accepts the Mossad’s assistance in preventing the attack. Charlie returns to London from the PLO training center and finally meets Khalil (Chanif Ghattas) who gives her the bomb that she will place in the lecture hall where Minkel will make her presentation. Everything seems to be going according to Kurtz’s master plan until a sudden shift in his strategy jeopardizes both Charlie’s life and her mission to bring in the terrorist ringleader. The BBC/AMC’s previous skillful adaptation of le Carré ‘s The Night Manager gave me some high hopes for The Little Drummer Girl. However, the efforts of writers Michael Lessie and Claire Wilson and director Park Chan-wook to bring this well-received novel to the small screen produce a mixed bag of results. Only veteran actor Michael Shannon, sporting a laughably fake German accent, appears out of his element; the remaining cast is spot-on. Florence Pugh successfully metamorphoses from self-absorbed actress to a convincing yet vulnerable double-agent. Despite their obvious age differences, Alexander Skarsgård creates a credible Pygmalion-like relationship with her that hints a blossoming romance. Author le Carré admitted during an interview that this show was a slow-burner. Viewers might be tempted to pack it in after the somewhat tedious beginnings but the two final episodes will eventually give those who stick with this mini-series their due reward. After Charlie meets and beds the less than charismatic Khalil, the pace considerably picks up, the tension mounts, and I willingly buckled up for the bumpy ride to the finish. Given the low bar set by the 1984 film version of The Little Drummer Girl (although it was more faithful to the novel), this mini-series is well worth your patience and introduces American audiences to a young English actress whose star is surely on its ascendance. 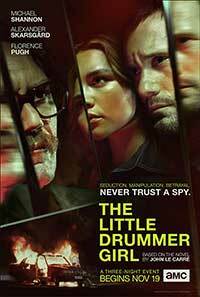 The Little Drummer Girl completed its run on AMC and is now available in its entirety on AMC on Demand and via the AMC app. A slow-burning account of international spy intrigue, terrorism, and the reluctant recruitment of a young actress as a double agent that eventually rewards patient viewers with a decent BBC/AMC adaptation of another le Carré novel.